Atlantic Station is a mixed-use neighborhood on the northwestern edge of Midtown Atlanta, Georgia, United States. First planned in the mid-1990s and officially opened in 2005, the neighborhood's 138 acres (558,000 m²) are located on the former brownfield site of the Atlantic Steel mill. Developer Jim Jacoby, who also redeveloped Florida's Marineland, began putting the project together in 1997 when his company became the property contractor of the land. The redevelopment of the land into what is now Atlantic Station was financed largely by private investment, but was heavily supplemented by a special tax districtto pay for city tax bonds for public utilities (streets, sidewalks, and sewers). The development was originally planned to include 15,000,000 square feet (1,400,000 m2) of retail, office, residential space as well as 11 acres (45,000 m2) of public parks. Its size encouraged the Postal Service to award the neighborhood its own ZIP code: 30363. Atlantic Station was designed with energy efficiency in mind and many of the buildings are LEED certified. Additionally, the project was developed to help mitigate urban sprawl and reduce air pollution by allowing many more people to live and work within walking distance of most everyday things they need, with many alternative transportation options nearby. The proposedBeltLine transit/greenway project is expected to pass within a few miles of the development. In October 2003, the very first residents moved into the development. The 17th Street bridge was completed in January 2004 and the first round of retail establishments opened in October 2005. Atlantic Station received the EPA's 2004 Phoenix Award as the Best National Brownfield Redevelopment, as well as the Sierra Club's 2005 America's Best New Development Projects listing. In July 2005, a pre-dawn fire completely destroyed a large wood-frame residential building under construction. Two days later, it was ruled arson after a major investigation. In addition to the destruction of the 65-unit Element building, which was only framed-in at the time, another 80 inhabited units at the Art Foundry across Mecaslin Street had damage to the facade, including scorching, broken windows, and melted miniblinds. At least five million dollars of damage was done to the buildings, 18 cars parked on the street were destroyed and another 7 were seriously damaged from the intense heat. 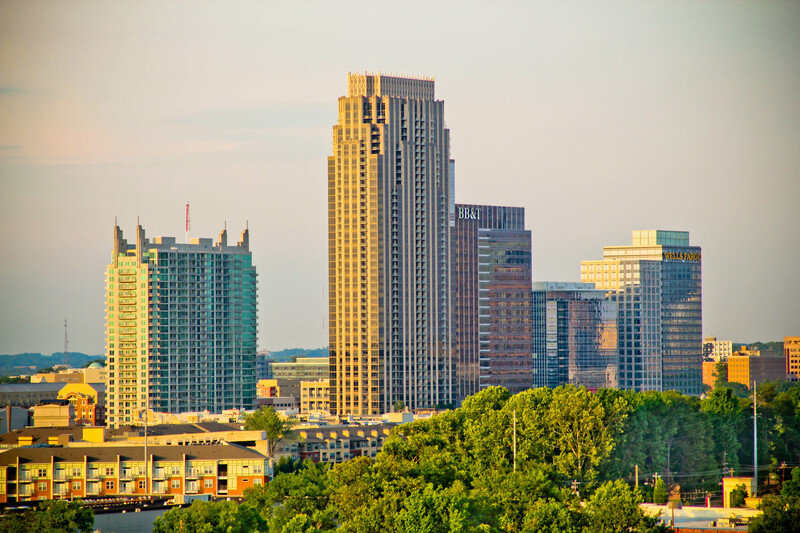 Atlantic Station comprises three distinct areas that are lined along 17th Street between the Downtown Connector andNorthside Drive, the District, the Commons, and the Village. The District is where most of Atlantic Station's retail and office space is located. Opened on October 21, 2005, it was constructed in the style of an outdoor mall, with choices of shopping, dining, and a 16-screen Regal movie theater. Above the retail levels is an additional two to three stories of condominiums. With the 7,200-space parking garage underneath, the shopping area is pedestrian-friendly and many of the surface level streets are often closed off for special events. The southwest corner of The District is home to the 26-story, 336-foot (102 m) TWELVE Hotel and Residences Atlantic Station, which was completed in December 2005. In addition, townhomes constructed in 2004 line 16th Street one block south of The District. The District's office space is located along the six-lane 17th Street Corridor, and is home to the 22-story tall 171 17th Street, known as the Wells Fargo Building and completed in 2004, and the 17-story 201 17th Street, completed in 2007. Developed by AIG Global Real Estate, 171 17th Street was awarded the silver certificate in the U.S. Green Building Council's Leadership in Energy and Environmental Design (LEED) Core and Shell Development program. 171 17th Street became the first-ever LEED Silver-Core and Shell certified high-rise office building, and the first high-rise office building in Georgia to receive any LEED certification. The 25-story BB&T Tower at 271 17th Street was completed in 2009, becoming Atlantic Station's tallest office tower. 271 was built by Brasfield & Gorrie. The Commons is home to many low-rise condominiums, apartments, townhomes, and a large man-made stormwater retention pond that is located within the median of 17th Street. The Village is located on the westernmost portion of Atlantic Station, along 16th Street, and comprises an IKEA store that opened in 2005, as well as two apartment complexes. Adjacent to the Commons pond is the Millennium Gate, an $18 million arch intended to celebrate peaceful accomplishment, with special attention paid to Georgia's rich history and people. The Millennium Gate opened July 4, 2008. As of 2008, it is the largest classical monument to have been dedicated since completion of the Jefferson Memorial in Washington, D.C..Hugh Petter of ADAM Architecture was commissioned by the National Monuments Foundation to work alongside National Monuments director, Rodney Cook Jr., to develop the initial concepts into the final architectural design. The design is embellished with a sculptural allegory by Alexander Stoddart, telling the story of peaceful accomplishment over the last 2000 years. It houses 12,000 sq ft (1,100 m2) of gallery space, featuring traditional and modern exhibits. Collections of artifacts and family histories contribute to exhibits showcasing the pioneering and philanthropic spirit behind the development of Atlanta. Other exhibits include a recreation of the 1928 Rhodes-Robinson House foyer located on West Paces Ferry Road and a recreation of Thomas K. Glenn's office. Mr. Glenn, the late chairman of Trust Company bank, in the 1930s ran Atlantic Steel, previous owner of the land that is now Atlantic Station. Glenn's family is among the project's supporters. The Millennium Gate has been greeted with puzzlement regarding its purpose, and it has been criticized for its lack of historic significance and for being a plain imitation of similar designs in Rome, Paris and Munich rather than independent art. Because of its proximity to the IKEA furniture store, some observers have given it the nickname "Arc d’Ikea." The Gate's exhibits are open to the public. The rooftop penthouse, Foyer gallery, and Oval Lawn are available for weddings, conferences, and other events by booking only. The Millennium Gate also serves as a museum, but is only open to the public by appointment. The primary roadway access to and through Atlantic Station is an extension of 17th Street constructed by the developers. As part of the project, the Georgia Department of Transportation erected the yellow 17th Street bridge over the I-75/85 Downtown Connector expressway that separated Atlantic Station and the Home Parkresidential neighborhood from the rest of Midtown. Controversy developed at the time of construction not only because of the bridge's unusual yellow color, but also for GDOT's insistence that the bridge and street meet suburban highway standards. Indeed, the bridge is eight lanes wide, and the enormous right-of-way afforded to 17th Street east of the bridge lacks street parking and utilizes an unusual arrangement of placing street trees and lamps at the edge of the adjacent buildings' property lines instead of against the street. Motorcycles are not allowed. The section of the Street west of the bridge consists of four through-lanes of traffic, in addition to a bus lane,bike lane, and turning lanes in each direction, also lacking street parking. Access to public transportation is provided via a free shuttle that runs every 5 – 15 minutes to the Arts Center MARTA rail station and MARTA bus route (110 Peachtree St./"The Peach" ), which also serves the Arts Center Station. A railroad line runs along the northern border, but passenger service on the Crescent (Amtrak) is available only at the Peachtree Station in Brookwood, one walking mile away. In April, 2011, the city of Atlanta submitted a grant application seeking $22.5 million to relocate that station to the Atlantic Station community. Shuttle service is also provided by Lanier Parking Solutions, forGeorgia Tech students in the student apartments, the Flats. Despite the pedestrian-friendly arrangement of much of the eastern section of the project, parking is inexpensive and easily available in underground parking decks; indeed most visitors arrive by car.